The family of a Salt Lake City rapper fatally shot by police say he was struck in the back. They’re demanding to know why. 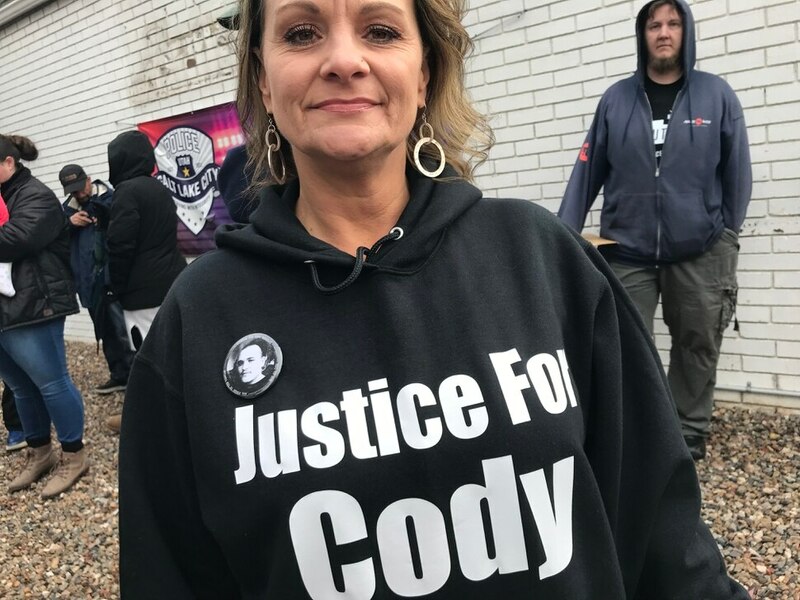 (Paighten Harkins|The Salt Lake Tribune) Sena Belgard, the sister of Cody Belgard, speaks at a rally on Saturday, Nov. 17, 2018. 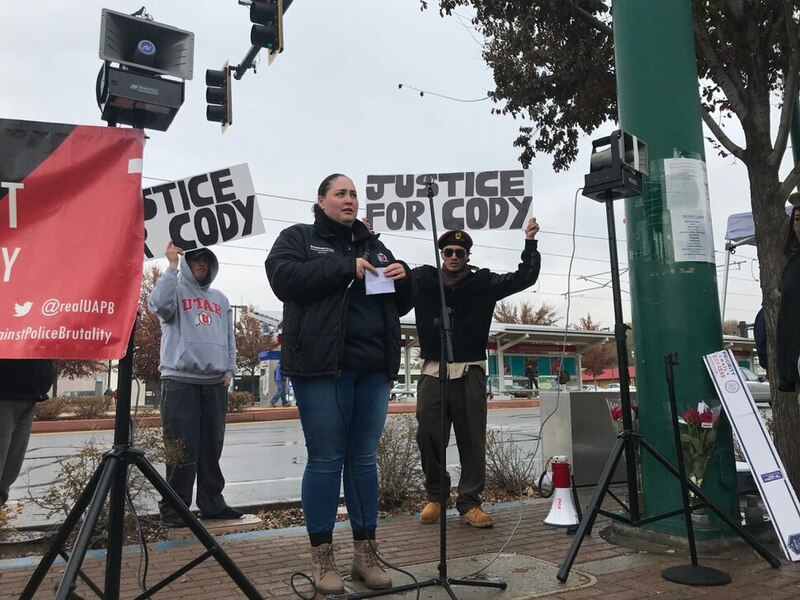 Cody Belgard was shot and killed by Salt Lake City police Nov. 9, 2018, and his family is demanding answers. Cody Belgard was shot in the back and killed by police in west Salt Lake City just over a week ago, and his family is still grappling with the basic questions surrounding his death. Why did the officer shoot? Why were the family not allowed to see Belgard’s body for days after he was killed? Why didn’t police interview witnesses at the scene? Was there body camera footage, and when can they see it? What kind of confrontation can a person be having with someone else if their back is turned? Family and friends have sought information themselves. They’ve listened to the 911 scanner from that night. They’ve talked to a witness and others who were nearby. They’ve observed the gunshot wounds in Belgard’s back, and tried to interpret statements from police about why they were pursuing Belgard that Saturday night. Little by little, they’ve pieced together a series of events, even if they don’t know exactly what happened in the seconds before Belgard was killed. But of all the questions they have, there’s one they may never understand, even when they get answers: Why Cody? Belgard was a teddy bear, Oliveros said. The 30-year-old wasn’t quick to anger. He was quiet, and as a musician in the Glendale community, known as See Smoke, he used rhymes and raps to express himself. He was the type of person who knew life was precious, his sister Sena Belgard said, and so he never missed the chance to give a loved one a hug. “He just wasn’t violent. He didn’t ever want to hurt anything,” said Sena Belgard. Cody Belgard died Nov. 9 after being shot by police near 800 North and Sir Philip Drive. “Due to his actions shots were fired,” police wrote in a statement this week. But Sena Belgard said her family received an autopsy summary that reported her brother died from two gunshots to his back. Police have released no information about what transpired before the shooting. 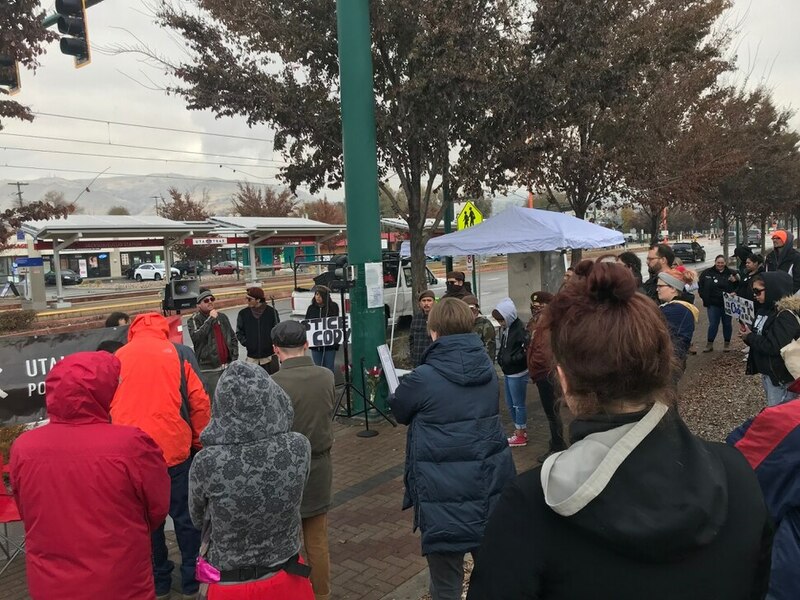 Utah Against Police Brutality, Rose Park Brown Berets and the Belgard family planned the 1 p.m. rally Saturday at the police station in Rose Park to demand more information about the fatal shooting, including body camera footage. About 50 people attended, standing in a shower of light raindrops as family, friends and activists against police shootings spoke between intermittent chants of “Justice for Cody!" Witness Nomi Armijo told The Salt Lake Tribune that Cody Belgard appeared to be going to her home just before he was shot. Armijo said she was parked in a car with her boyfriend and sleeping toddler outside her home, near the scene of the shooting, when she noticed Belgard walking toward her house. Belgard was her older brother’s best friend, Armijo said, and had been visiting frequently to record music with him. As Belgard reached her home, Armijo said, an officer slowly approached in a K-9 truck. Belgard turned and walked to the backyard, and the officer blocked Armijo’s car, got out and knocked on her car window, she said. He had a flashlight and a gun and ordered Armijo and her boyfriend to roll down the window, Armijo said. The officer returned to the police truck and a police cruiser passed, speeding around the corner with no lights or sirens, Armijo said. Armijo said she was scared and ran into her home. Armijo said she believes Belgard went through her backyard and a neighbor’s backyard to end up on Sir Phillip Drive, a block away; that’s where officers said police shot him. But she says she doesn’t know why they shot him. When he walked past her, she said, he was carrying nothing. Sena Belgard said she has asked investigators whether Cody had any kind of weapon, but they will not answer. West Valley City police are investigating the shooting. Armijo said she was mystified by officers’ report that Belgard fled from police earlier that night in a car, after officers confronted him and his girlfriend; Belgard appeared to have arrived on foot when she saw him approaching her family’s house that night, and she had not seen either Belgard or his girlfriend in possession of a car previously. His girlfriend was not with him when he was shot, Armijo said, and she called Armijo’s family after the shooting, asking if they had seen Belgard. Salt Lake City police have not described the car they said Belgard drove away from the Sugar House parking lot and have declined to comment on the shooting while it is under investigation. In a statement this week, police wrote that officers went to a parking lot at a strip mall at 2274 S. 1300 East, where they had been “notified about” a car that had been driven away from police a week earlier. Officers “made contact with the suspect and his girlfriend,” police wrote. “He was again noncompliant and due to his actions shots were fired,” police wrote, identifying the man as Belgard. Officers said they expected to release video footage from the shooting in the coming week. Belgard is the 14th person to be shot to death this year by police in Utah — a body count matched only in 2007 and 2014, when Utah officers also fatally shot 14 people. Since January, police have shot at 24 people, nine of those since mid-October. Belgard’s death was being mourned by Salt Lake City’s rap scene, which shared See Smoke’s songs in memorials as news of the shooting spread. Sena Belgard said her brother was so soft-spoken as a boy that when people first heard him rapping, around age 12, some were surprised to hear him talk at all. “Music allowed him to express himself,” she said. “If you would say something, he’d put it into a rhyme because that’s just the way his brain worked." In high school, Cody Belgard and his friends spent a lot of time at Glendale’s Sorenson Multi-Cultural Center, where they found a music studio, his sister said. After Cody Belgard died, fans shared “Creep Wit Me,” his homage to the neighborhoods and towns of the Salt Lake Valley. CREEP WIT ME FEAT. SHADE SHEISTfrom SEE-SMOKEon Myspace. In recent years Cody Belgard struggled with drug addiction, his sister said. He had faced drug possession and shoplifting charges — but never had been accused of any violent crime.